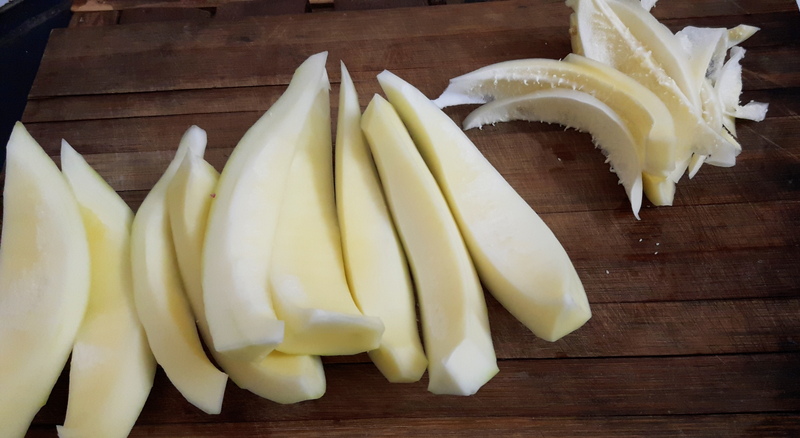 This is one of the most nutritious vegetable ever and it is organic too, grown in my kitchen garden without any use of synthetic materials, chemicals or pesticides. 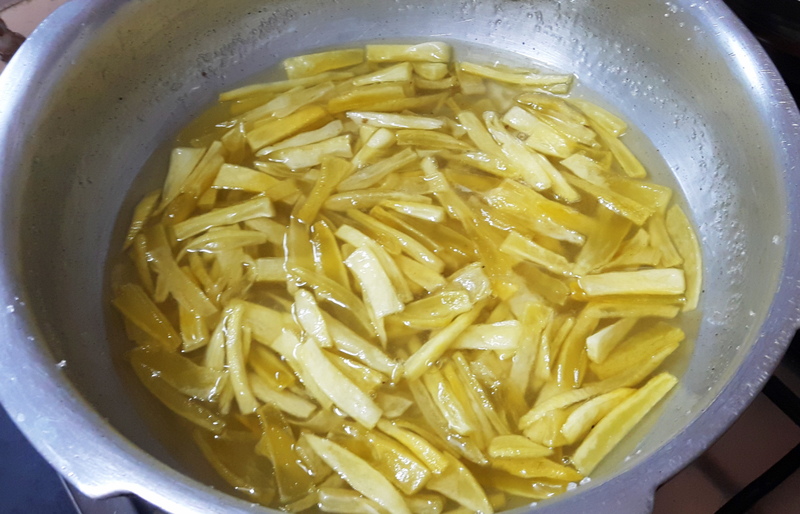 It helps boost stamina and an excellent source of iron, protein, fiber and calcium. 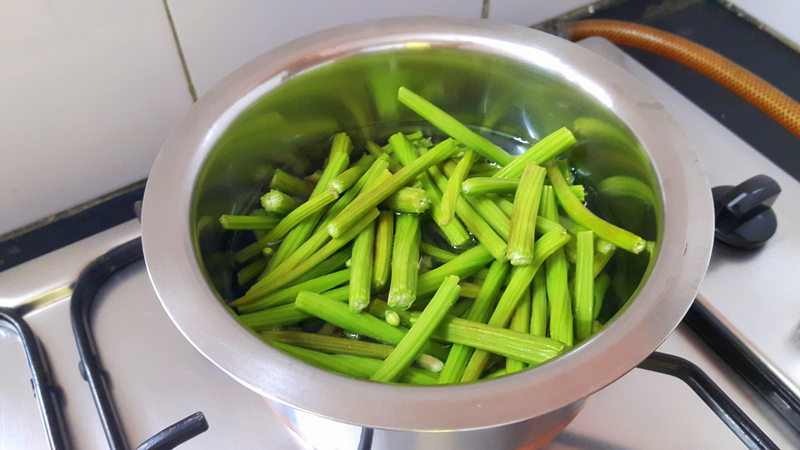 Blanch (put drumstick into hot water; boil couple of minutes, immediately put cold water and drain the water) the drumstick, keep aside. 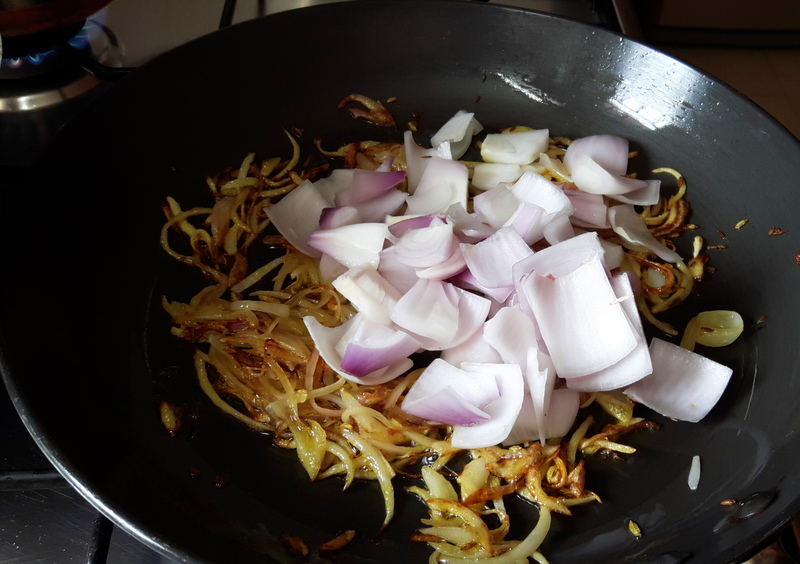 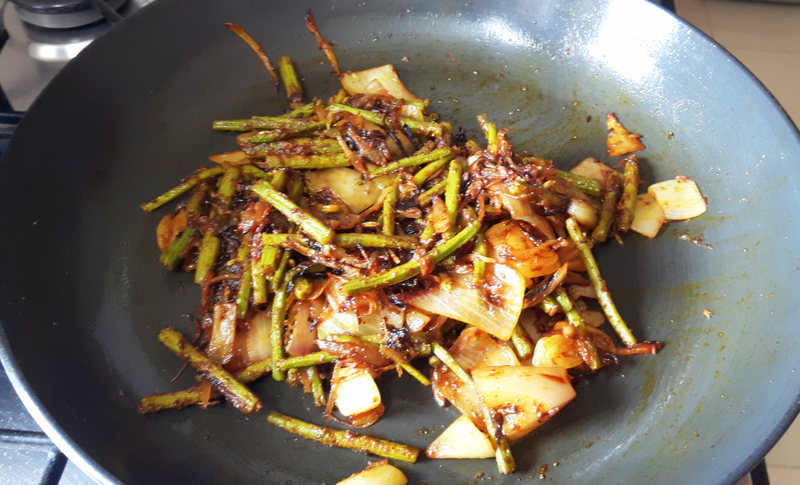 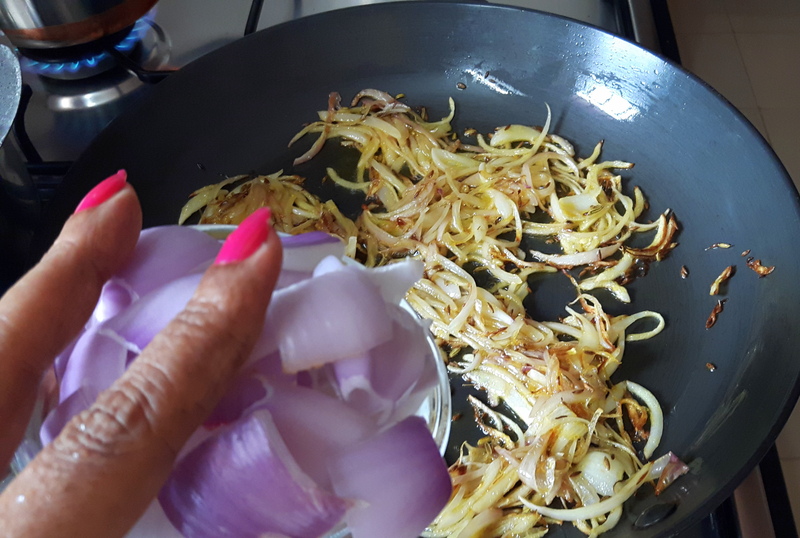 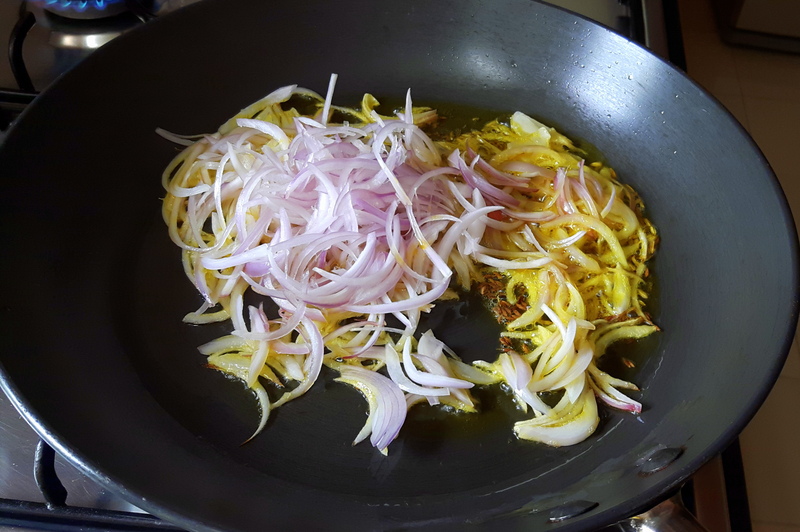 Heat oil in a fry pan, add longitudinally sliced onion; sauté on high flame till it gets light brown in color, add separated layers of onion, stir fry for couple of minutes and add blanched drumstick stir fry for couple of minutes. 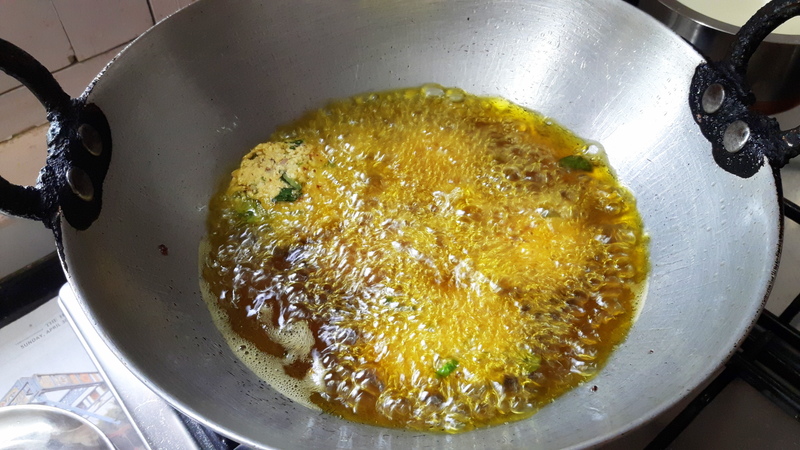 Add chili powder, coriander powder, turmeric powder and salt, cover and cook on lower flame until it is done. 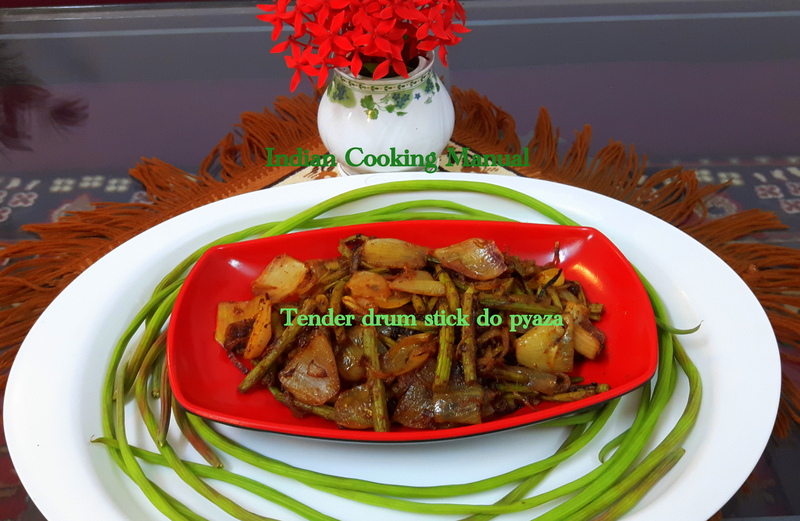 Add Garam masala and dry mango powder ‘Tender drumstick do pyaza’ is ready to serve. 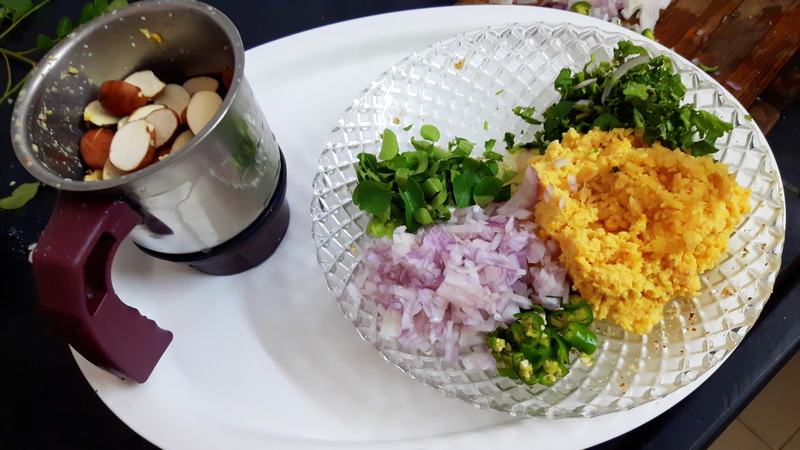 Transfer in to serving bowl and decorate with green coriander leaves. 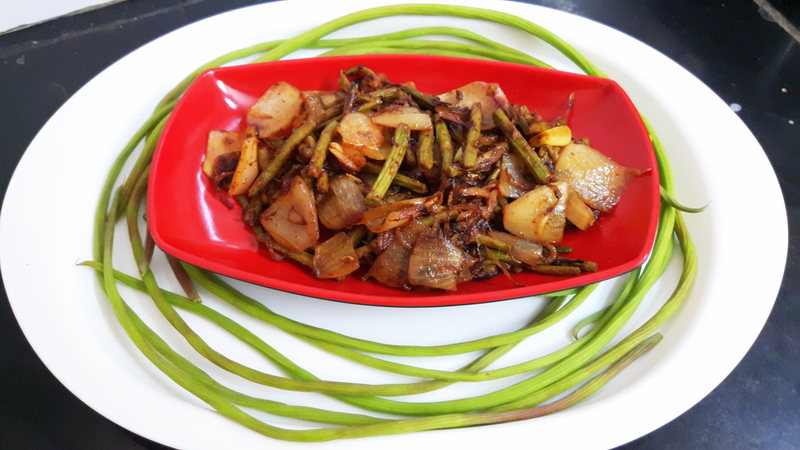 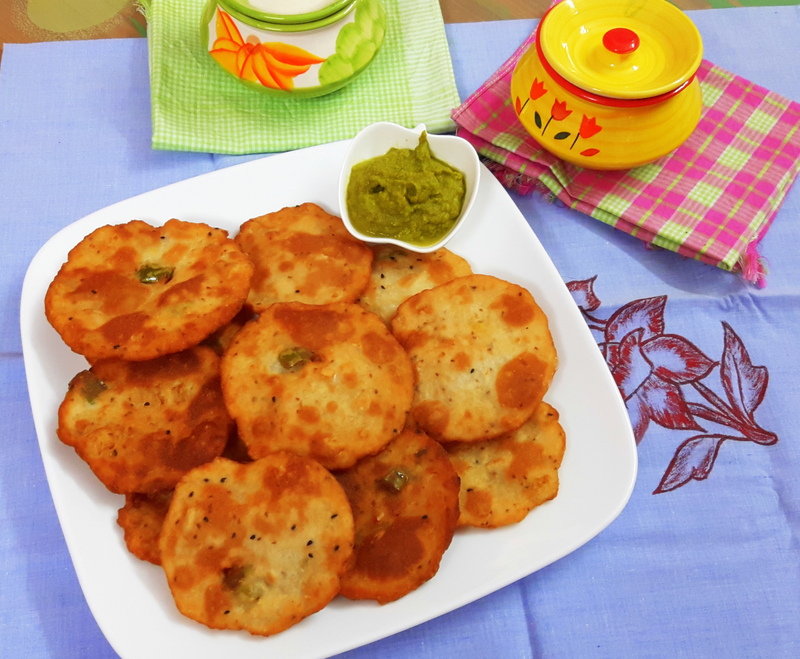 Serve with roti, paratha or as a side disc. 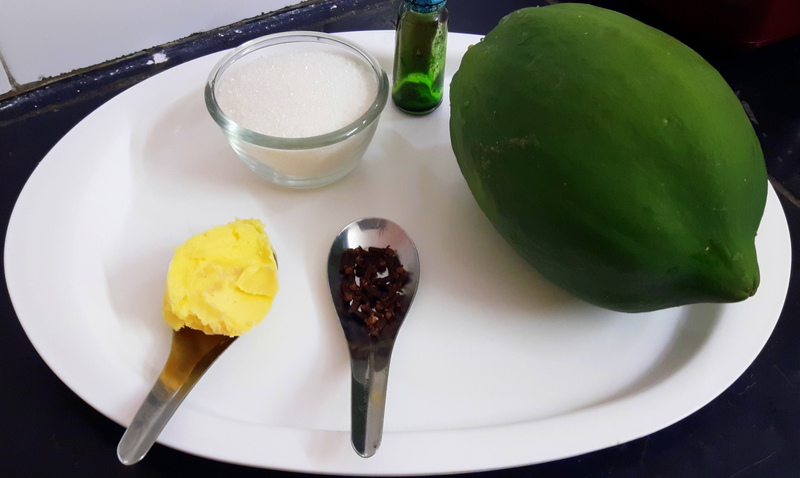 Papaya is widely cultivated not only in India, but also in Brazil; India and Brazil are the major producers of papaya. 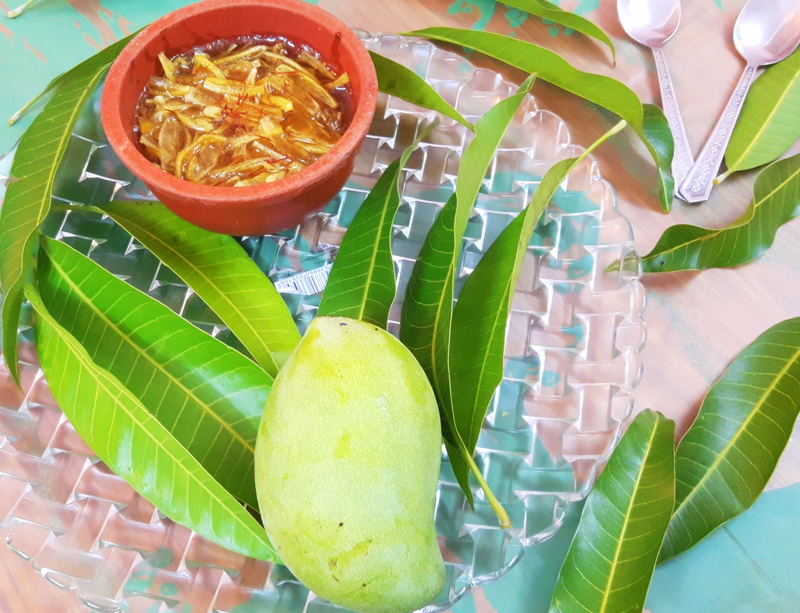 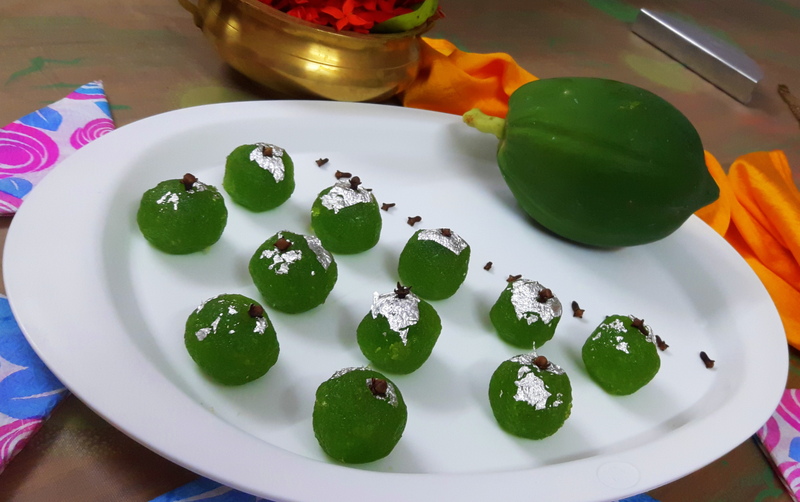 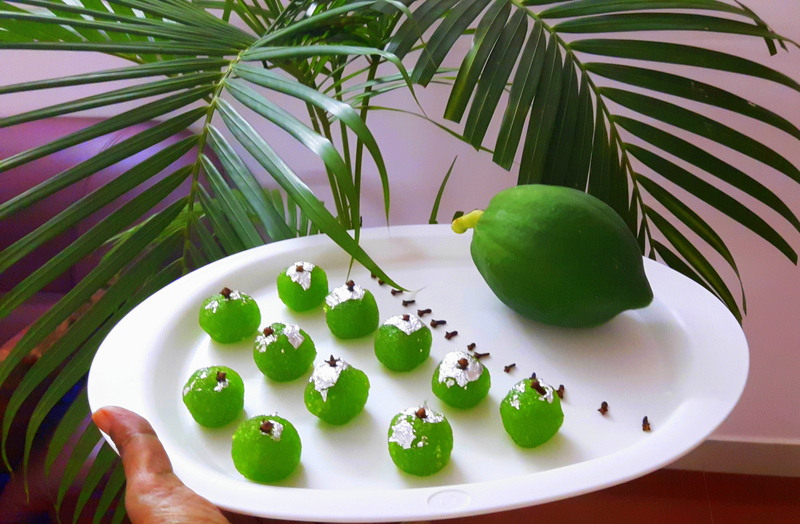 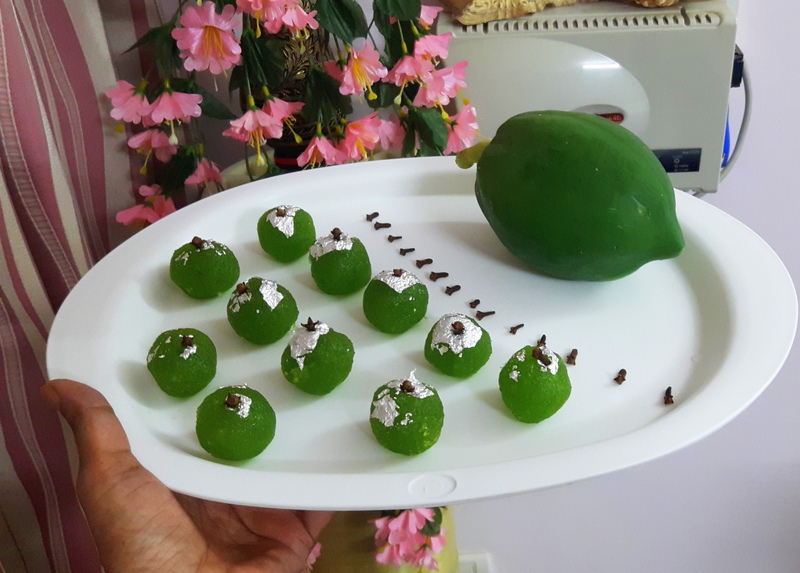 This sweets I tasted in Brazil on the occasion of my son’s marriage, you will be delighted to see your kids were happily enjoined this vitamin rich papaya ball which is garnished with clove. 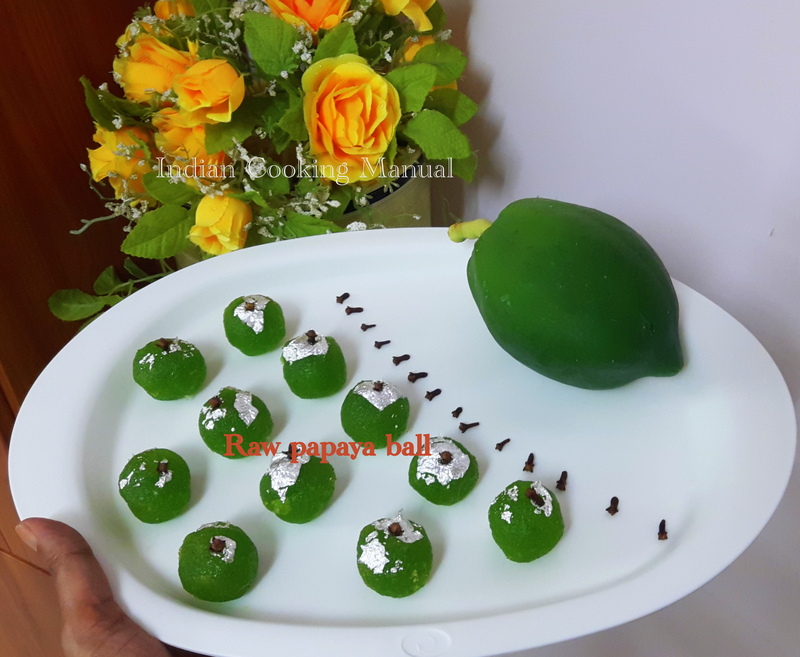 This papaya ball is wonderful for growing kids and as we know that raw papaya is good for liver. 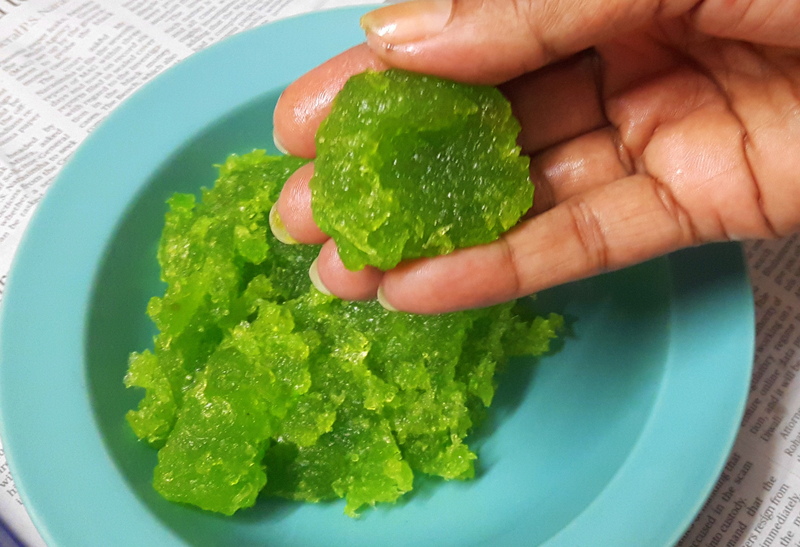 Edible color: 1-2 drop (optional). 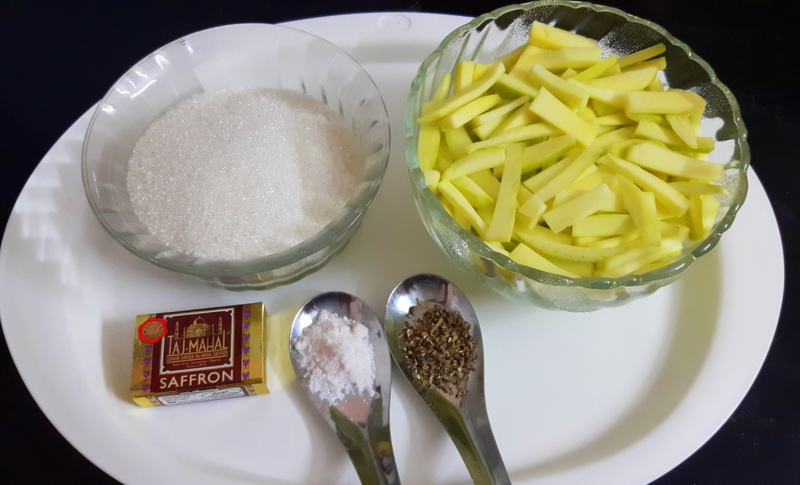 Peel off and Grate the raw papaya with the help of grater/food processor; boil/ microwave and squeeze as much as possible to get rid of water, keep aside. 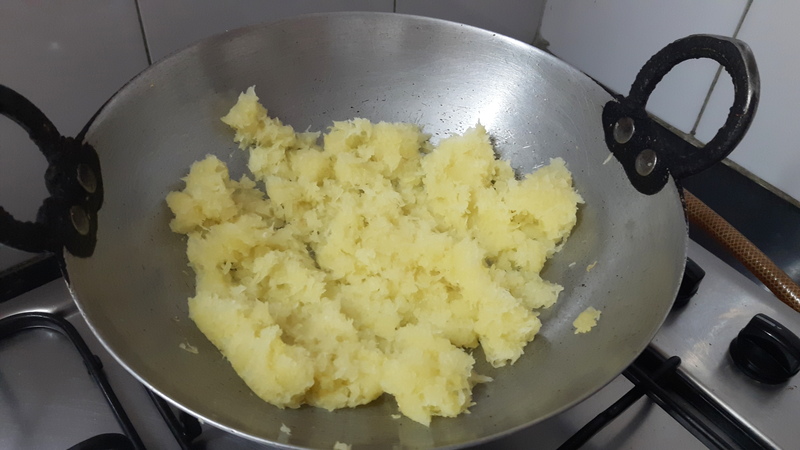 Heat butter in a pan; add boiled and squeezed raw papaya; stir fry on medium flame for couple of minutes and cover it with lid. 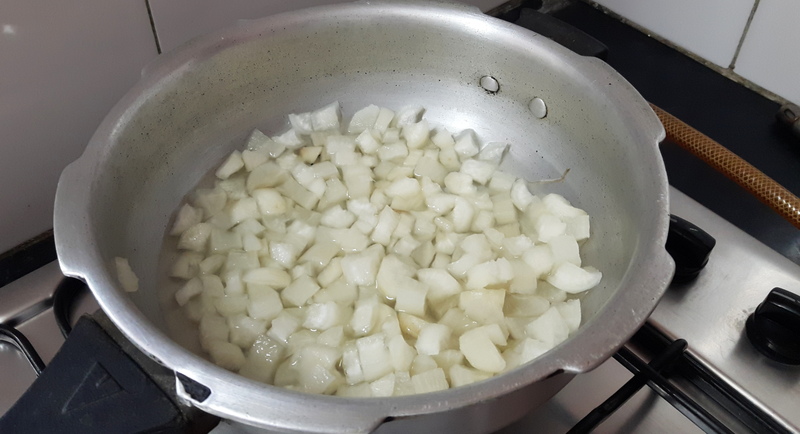 Further cook on low flame for 8 to 10 minutes, Keep stirring every 2-3 minutes. 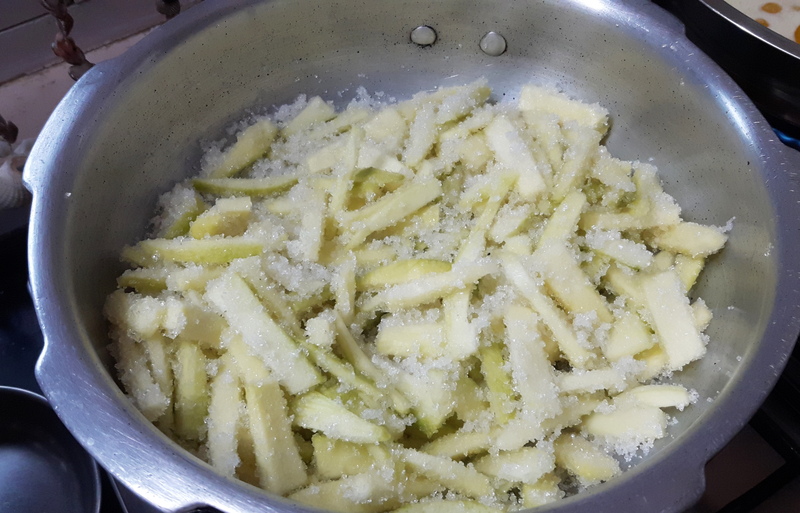 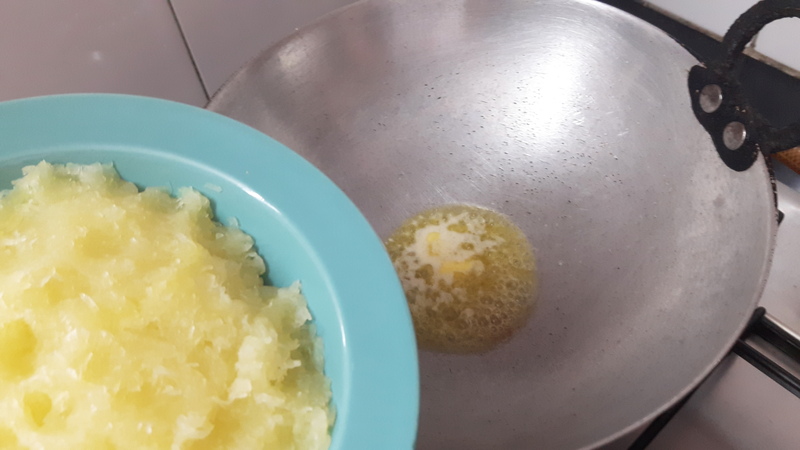 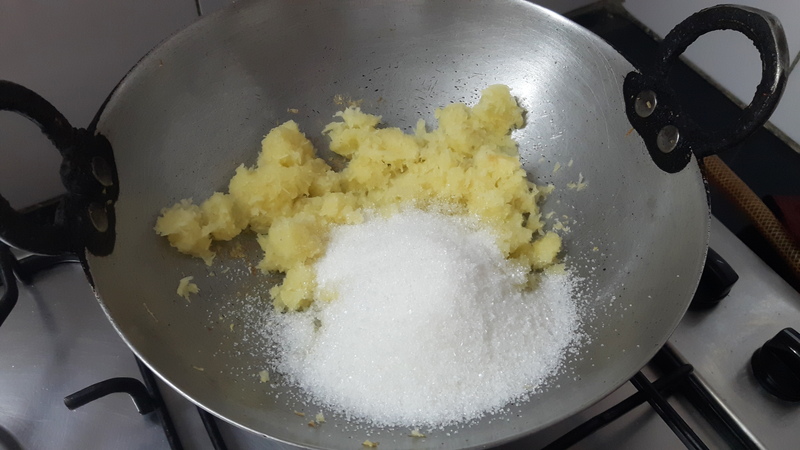 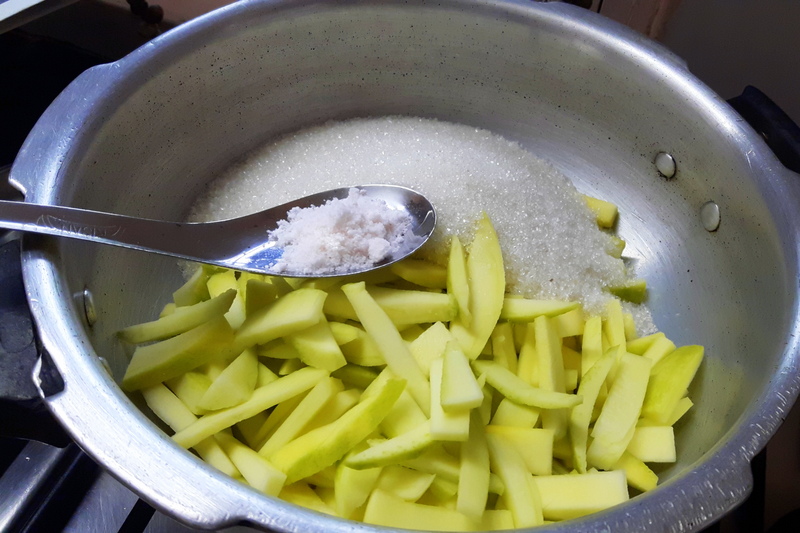 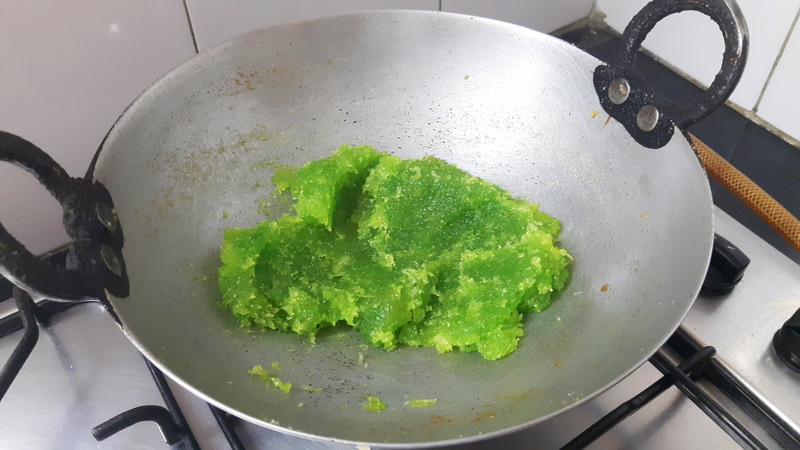 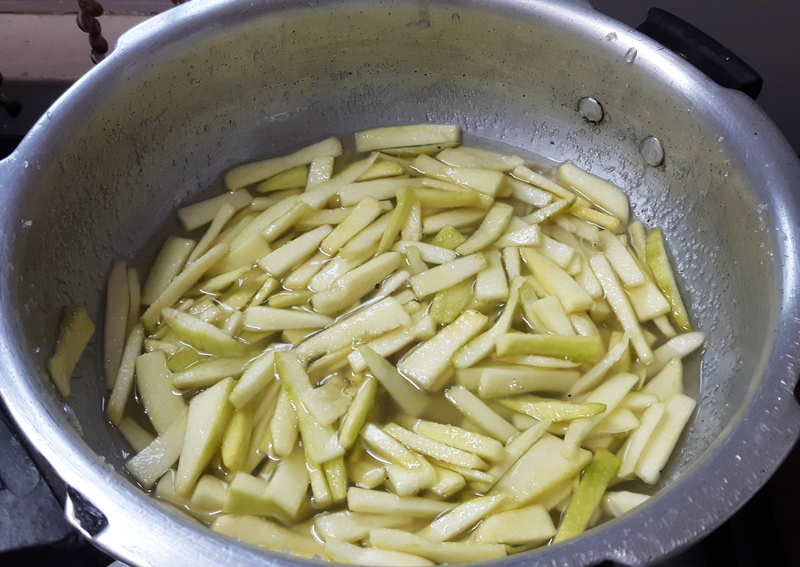 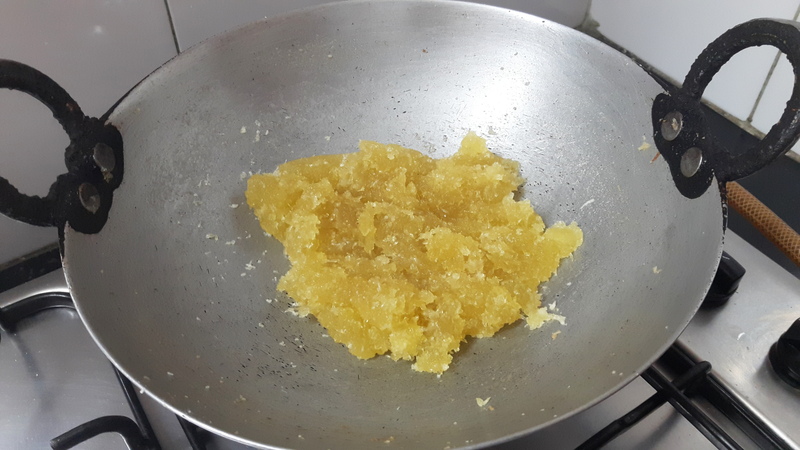 When all water gets evaporated; add sugar and cook about 5-7 minutes, until it gets the consistency of halwa, put off the flame, add edible color. 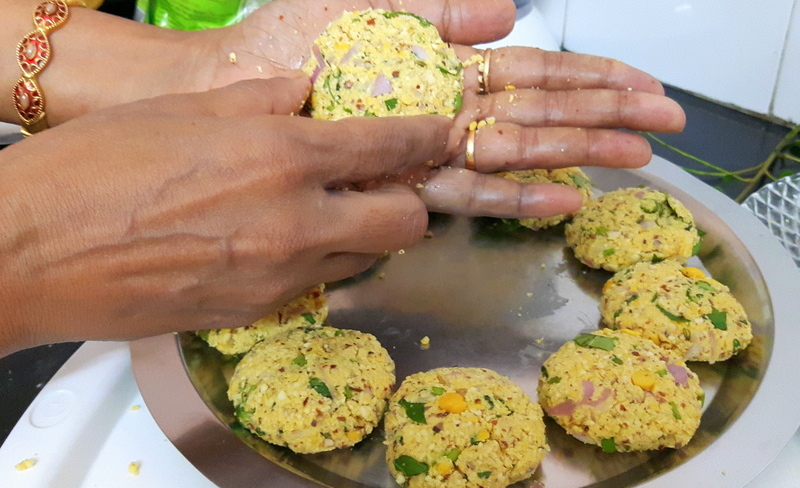 Mix them properly; let it cool till you will be able to bind it in the ball shape of laddu by your fist. 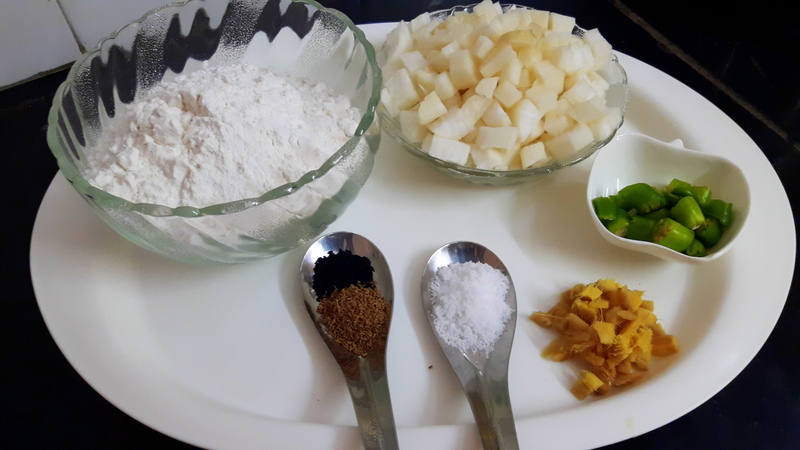 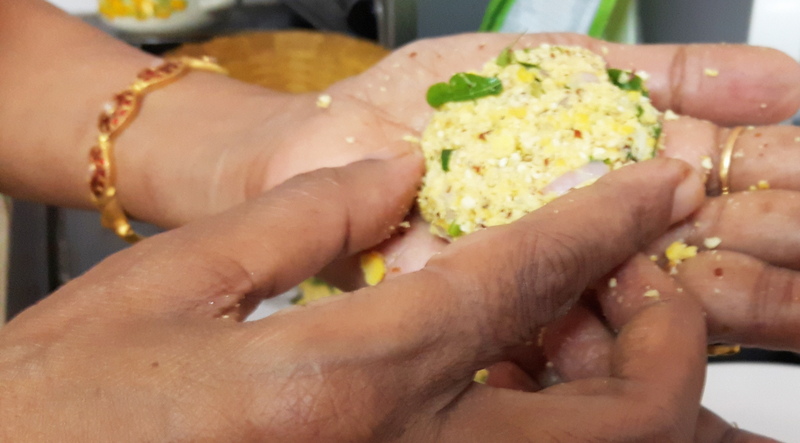 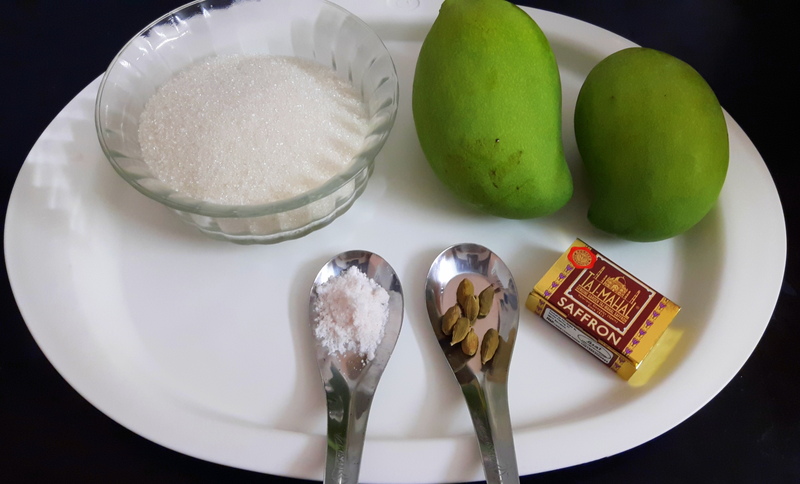 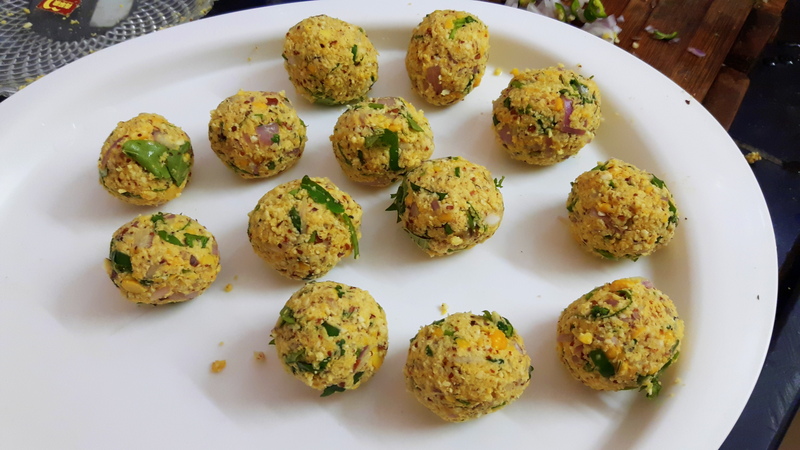 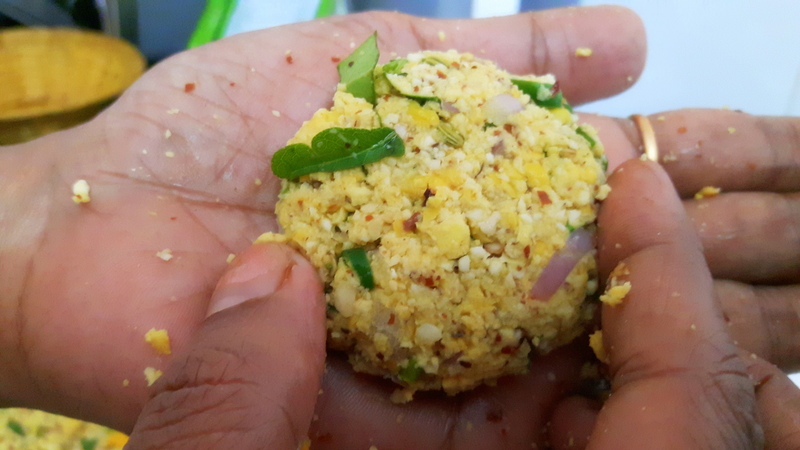 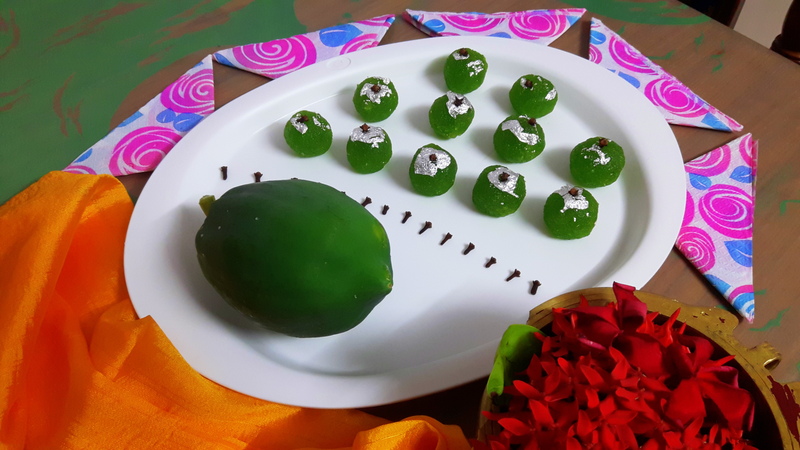 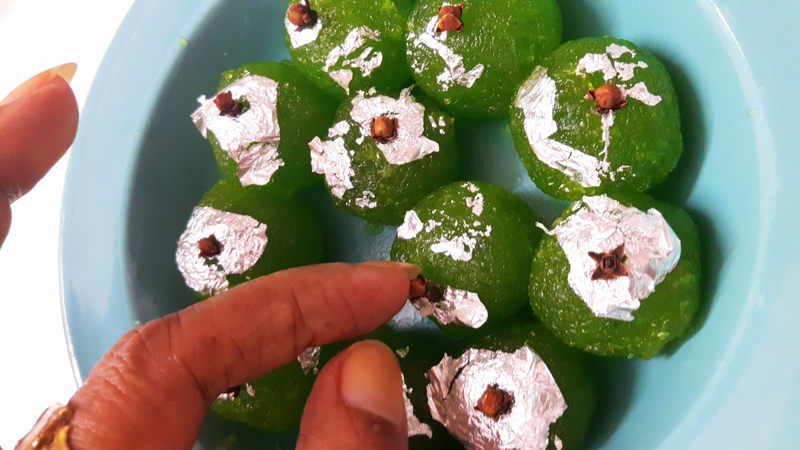 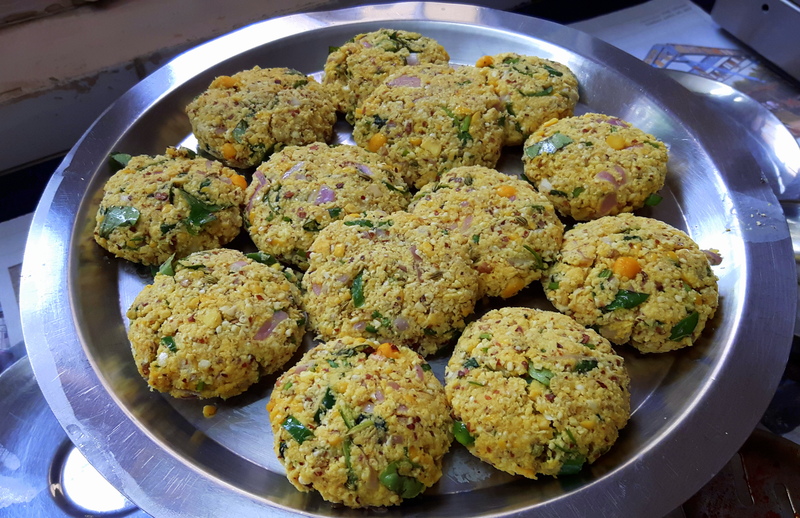 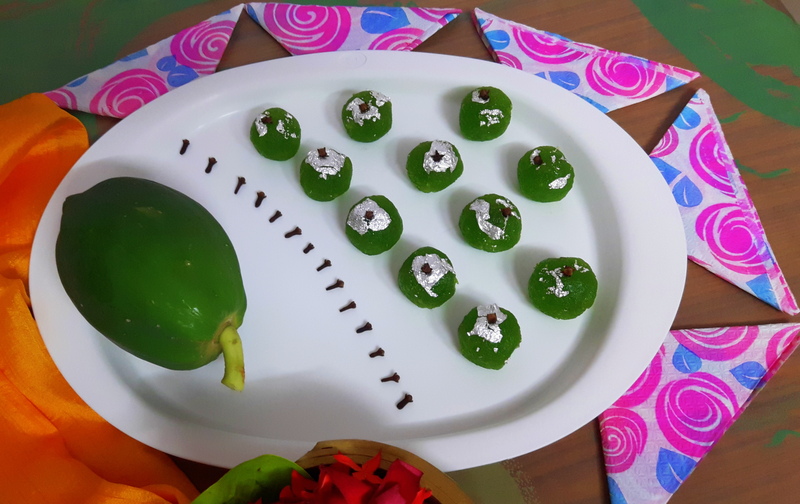 Take one handful mix; shape the mixture in laddu by using your hand/fist, depending upon size of laddu 12-15 laddu can be prepared, place the clove as shown in photo..
Decorate with Chandi ka verak, delicious ‘Raw papaya ball/laddu’ is ready to be served. 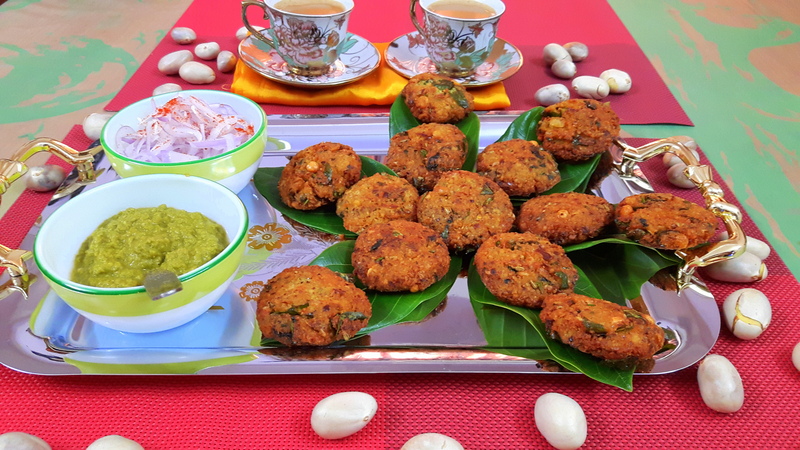 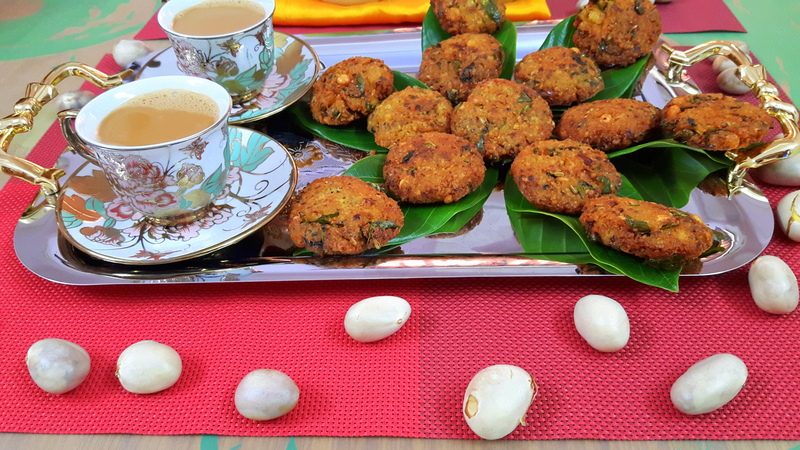 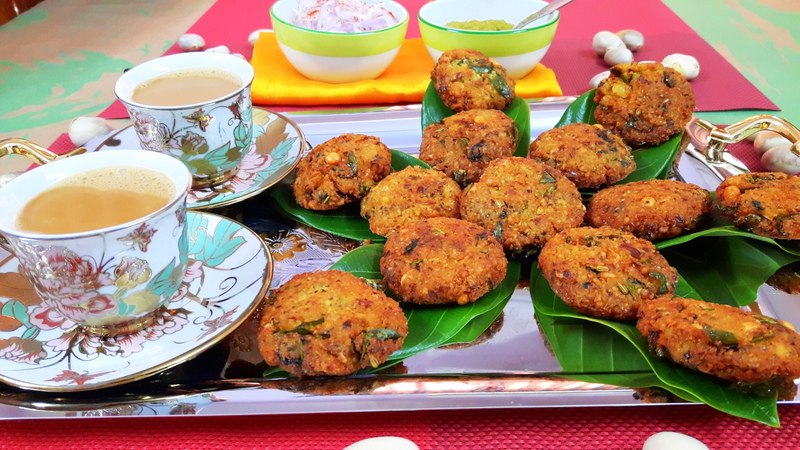 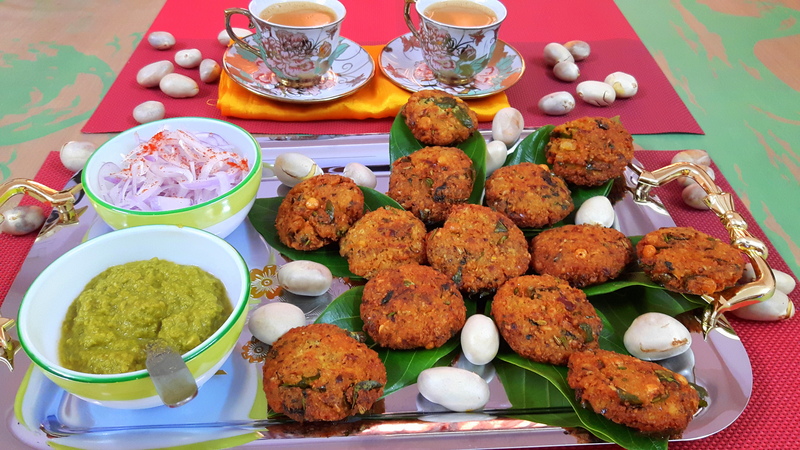 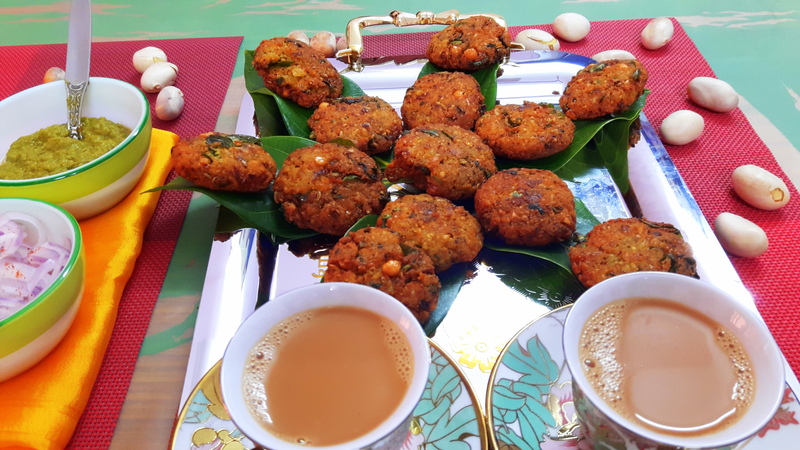 Homemade fritters (pakoda) with tea/coffee become more enjoyable, if rainy day on Sunday; the beautiful pearl of rain embellish the lawn grass and trees…aha it is the perfect time to sit in the porch and enjoy the day with family. 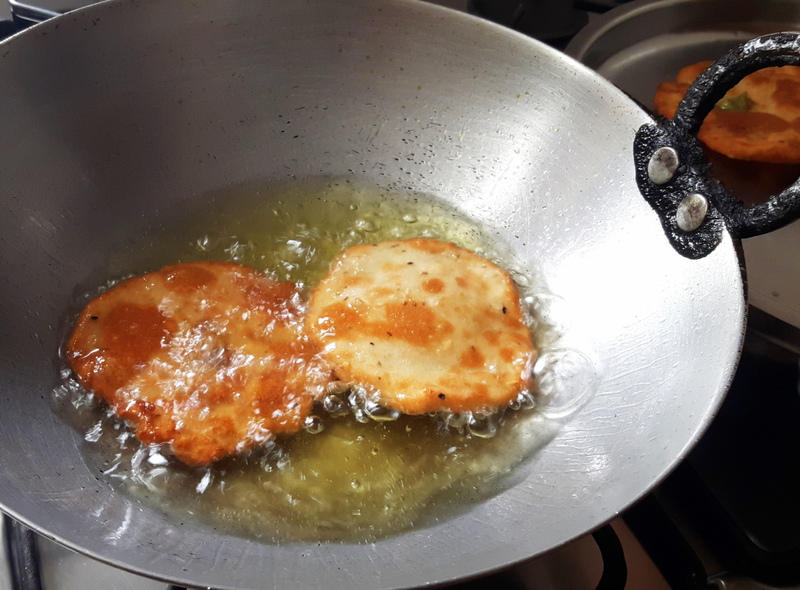 It was raining yesterday; I enjoyed and relished the ‘Jackfruit fritters (kathal ke beej ka pakoda)’, which had authentic taste from south India. 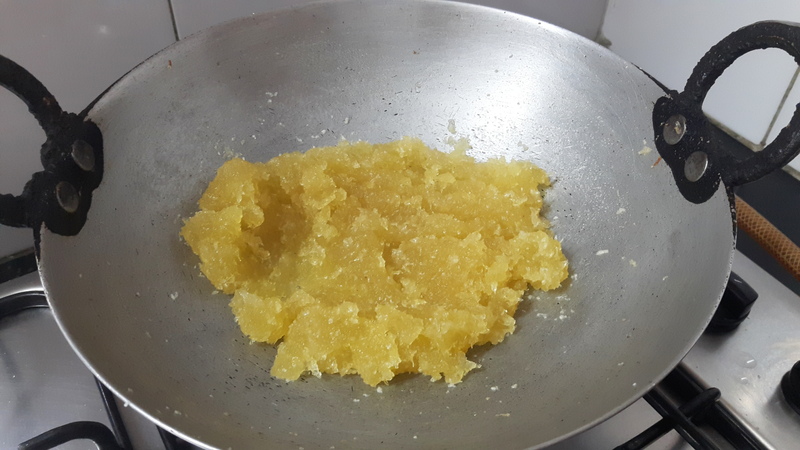 Soak chana dal 1 -2 hours, grind them roughly with help of small quantity of water, keep aside. 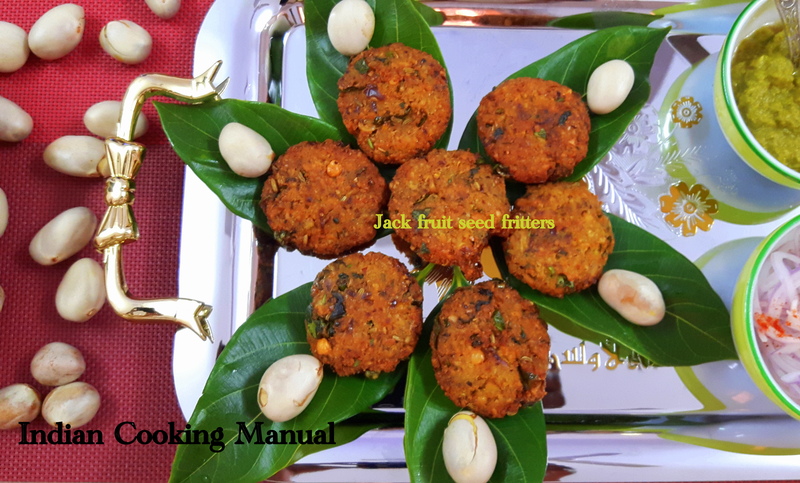 Grind Jackfruit seeds with help of small quantity of water, keep aside. 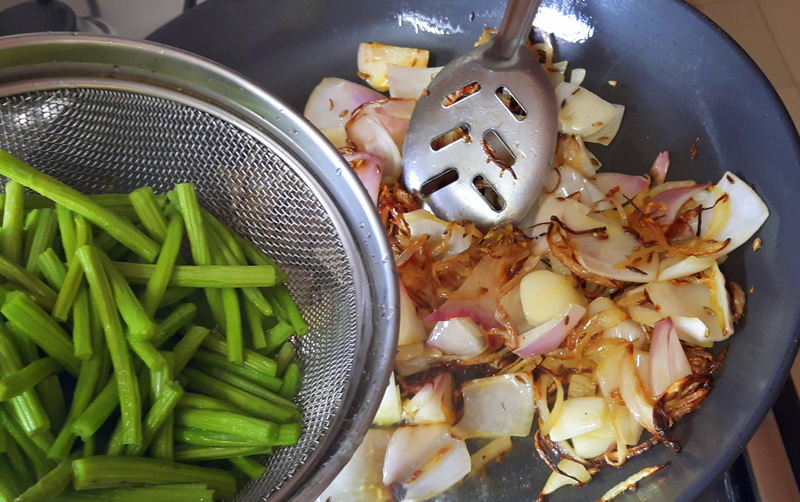 Chop green chili, ginger and onion into fine pieces, keep aside. 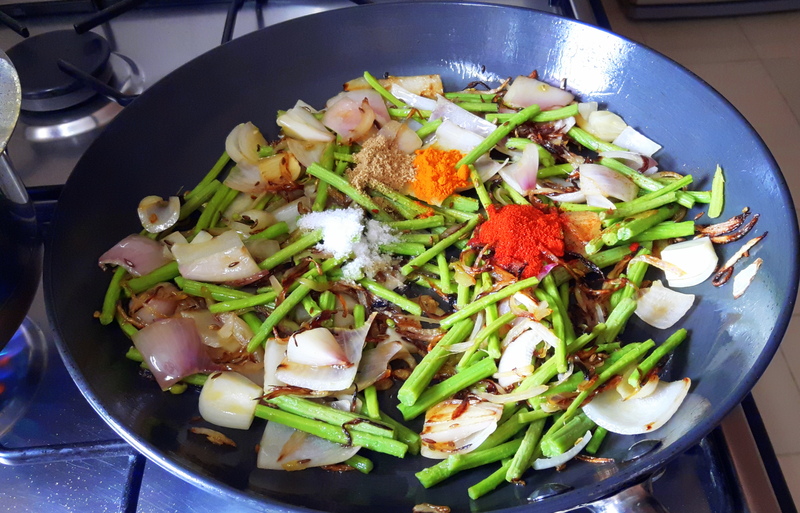 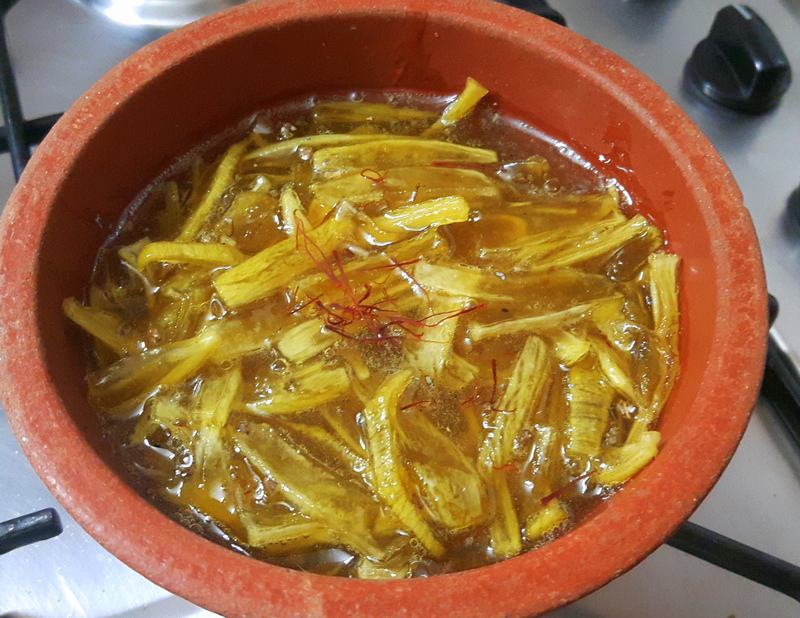 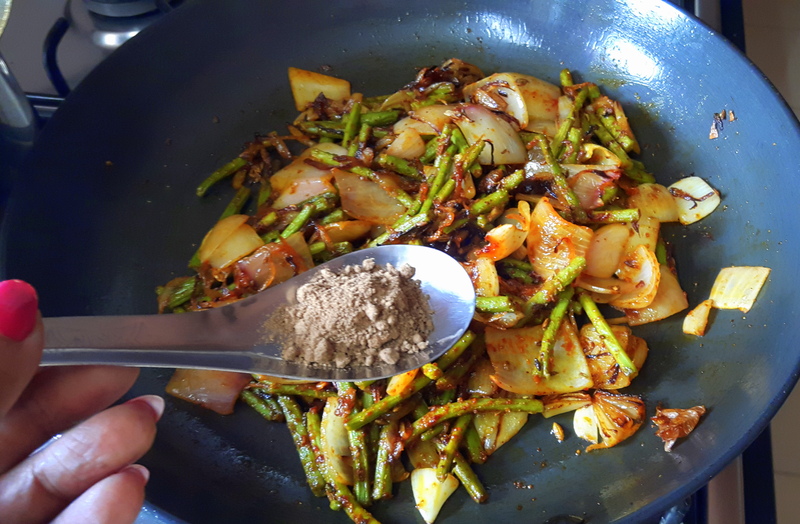 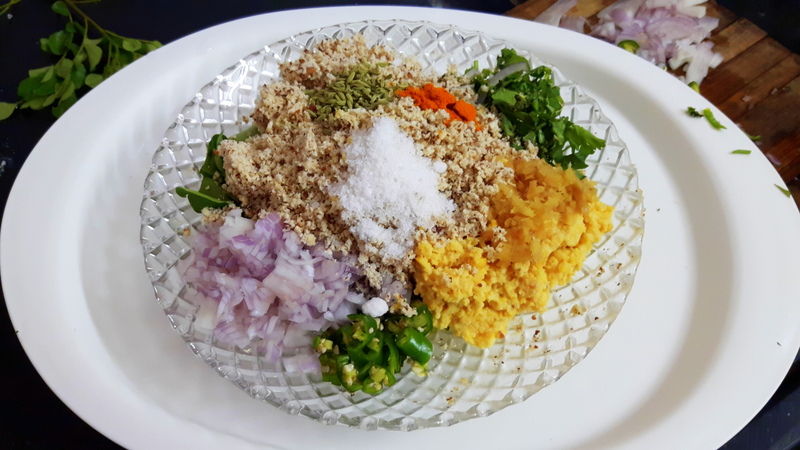 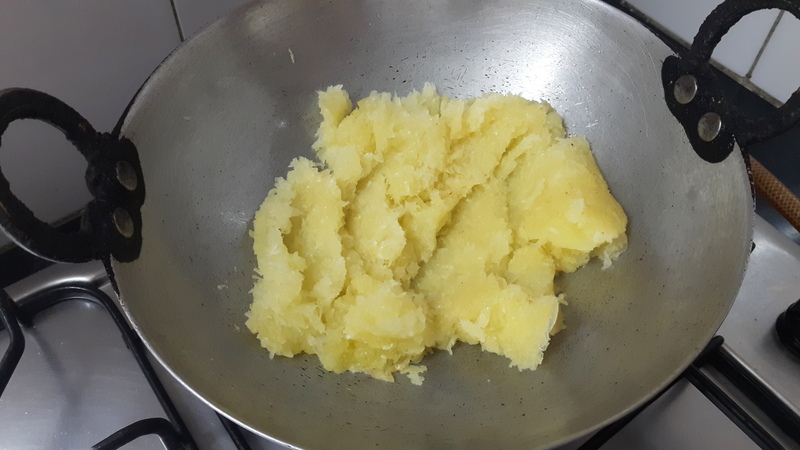 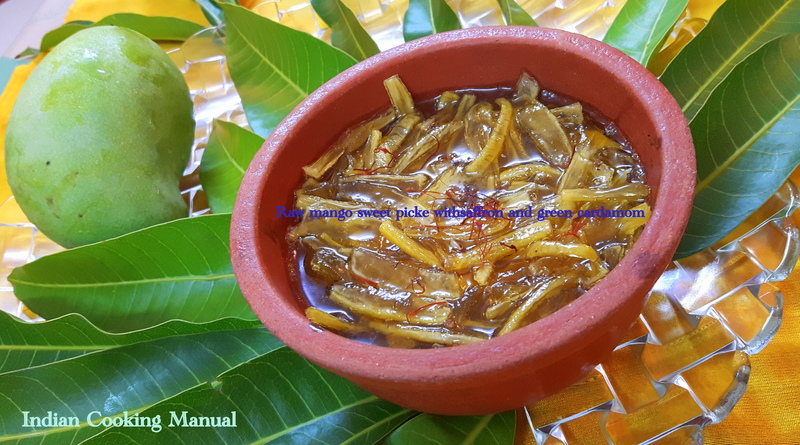 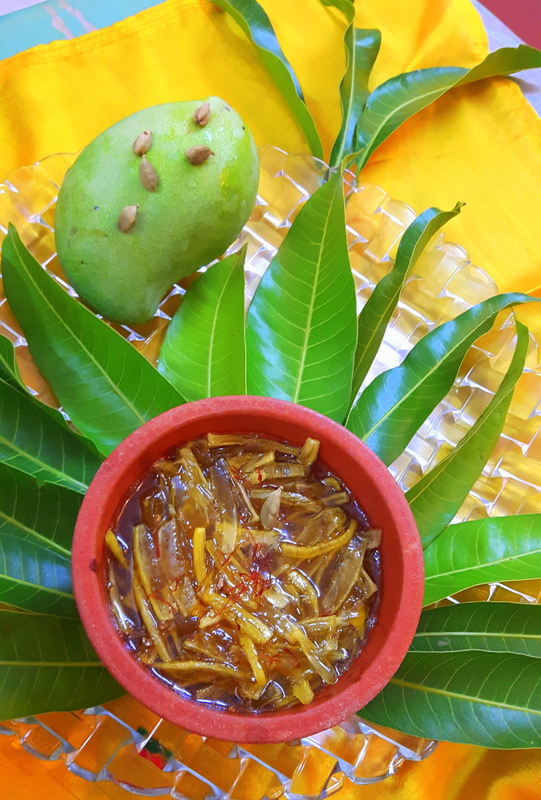 Take a mixing bowl; put dal paste, Jackfruit seeds paste, chopped green chili, ginger, onion, turmeric powder, fennel seeds and salt, mix properly. 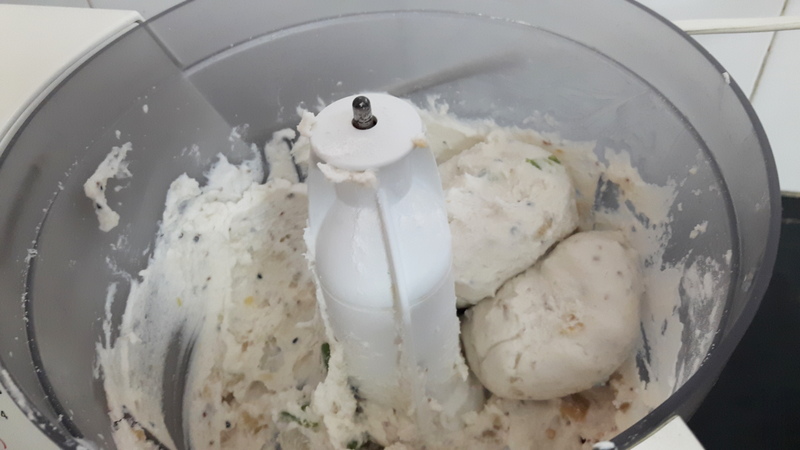 Now dough is ready; keep aside. 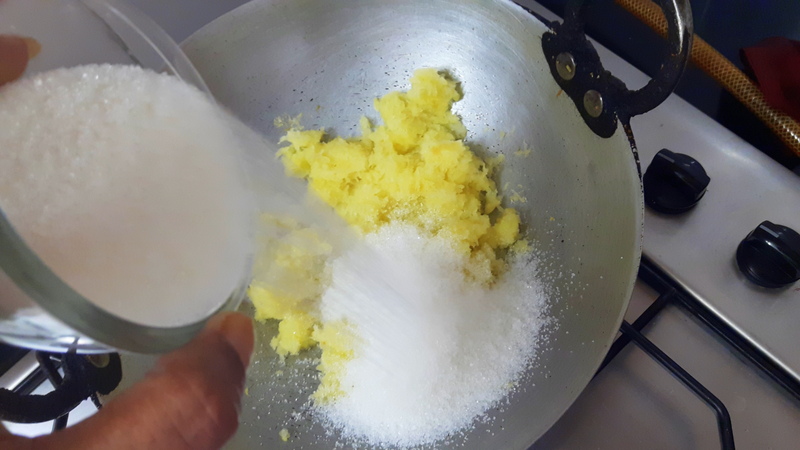 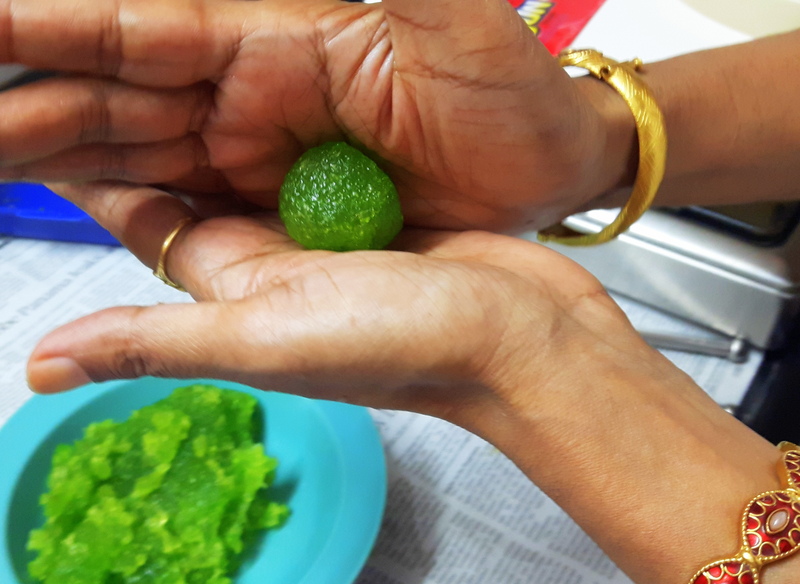 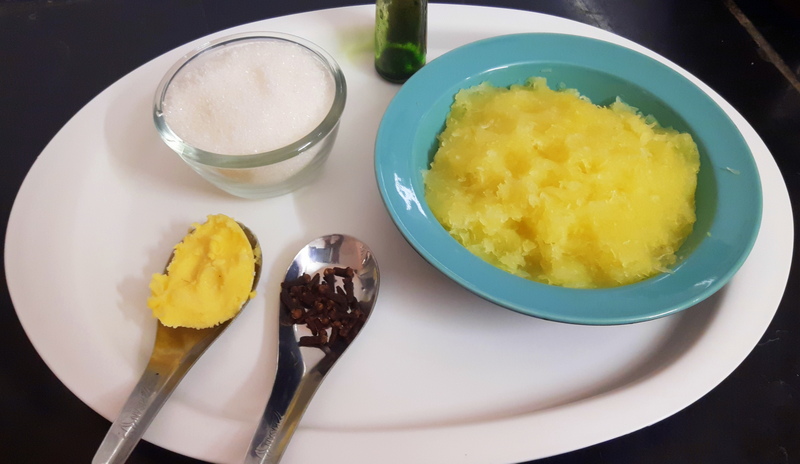 Take one handful mix; shape the mixture in lemon size ball by using your hand/fist, depending upon size of 12-15 balls will be ready, put the ball on your palm, slightly press it and give the shape of disc as shown in the photo. 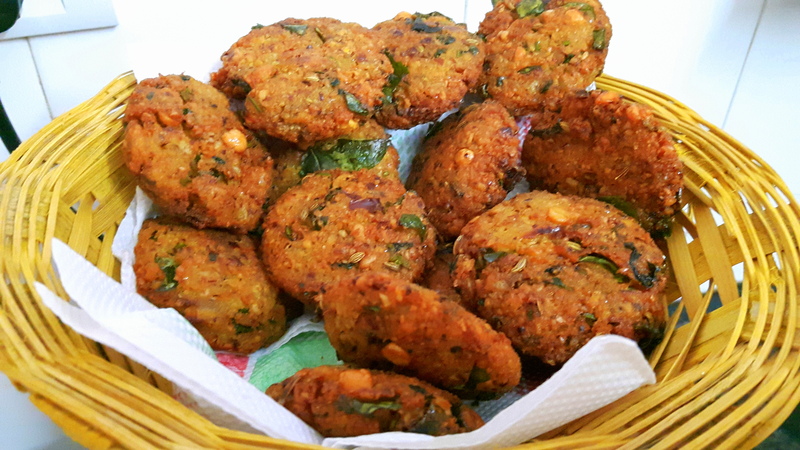 Note: you can prepare this in advance and store into refrigerator, and fry afterwards. 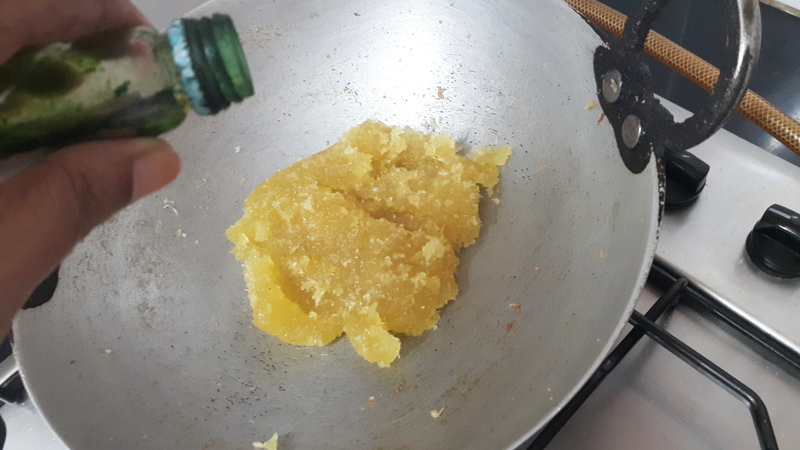 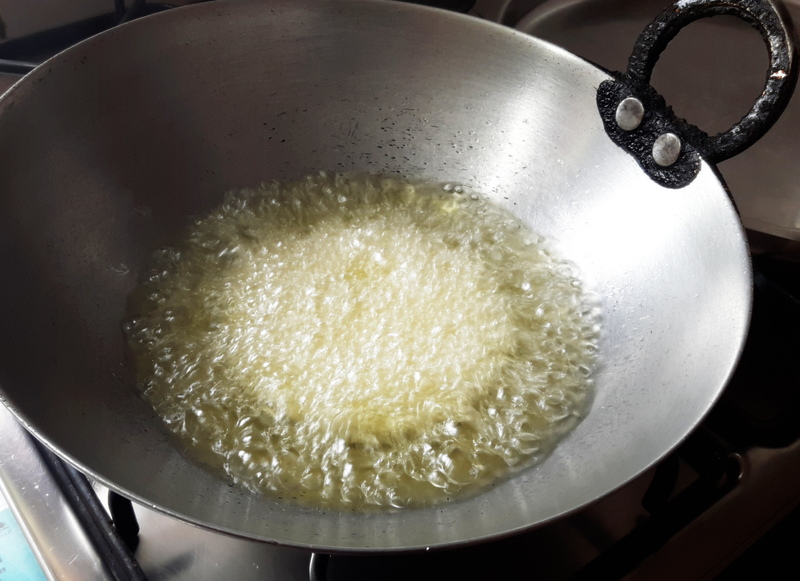 Take heavy bottom fry pan, put oil in the fry pan, and let oil to smoke, drop small amount of dough in it, If dough comes up, it means right temperature of oil otherwise wait for a while and test again. 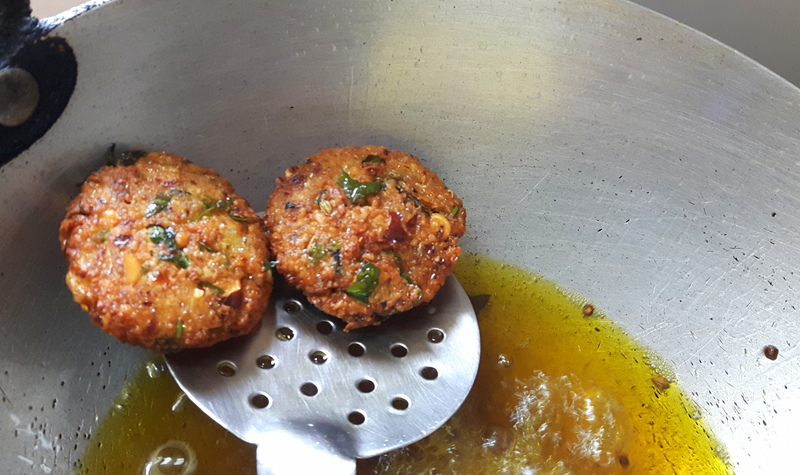 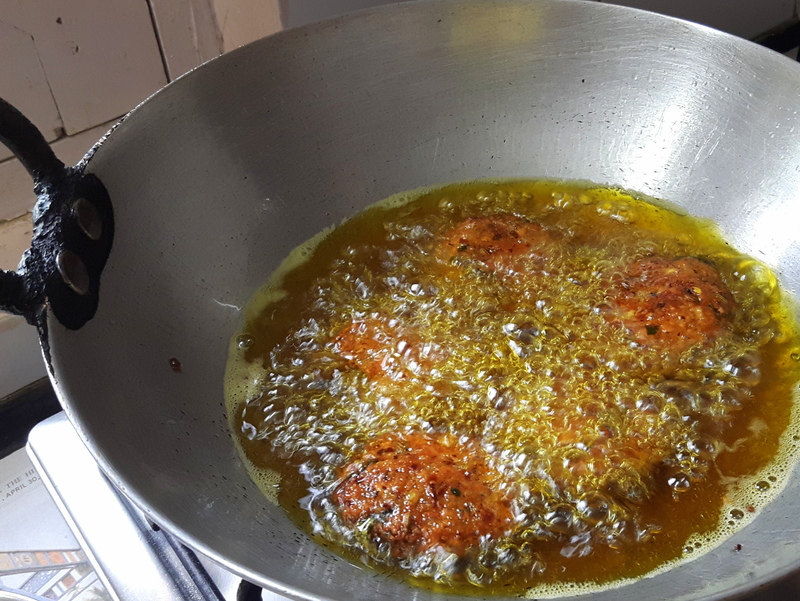 After getting right temperature of oil, deep fry all fritters in batches till golden brown, remove from oil. 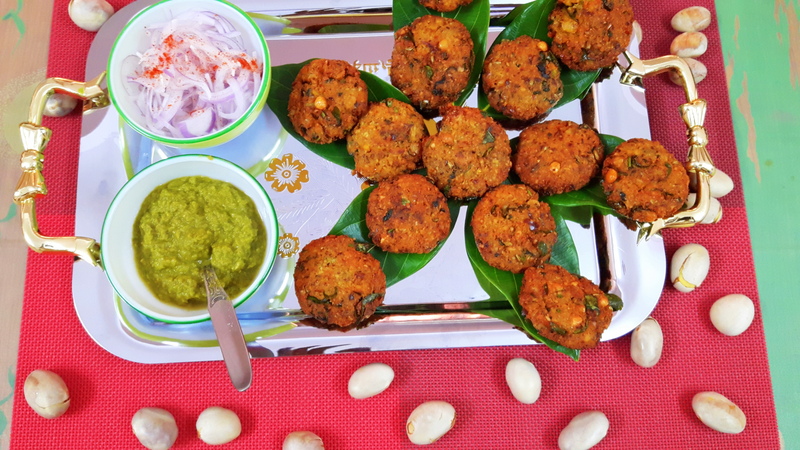 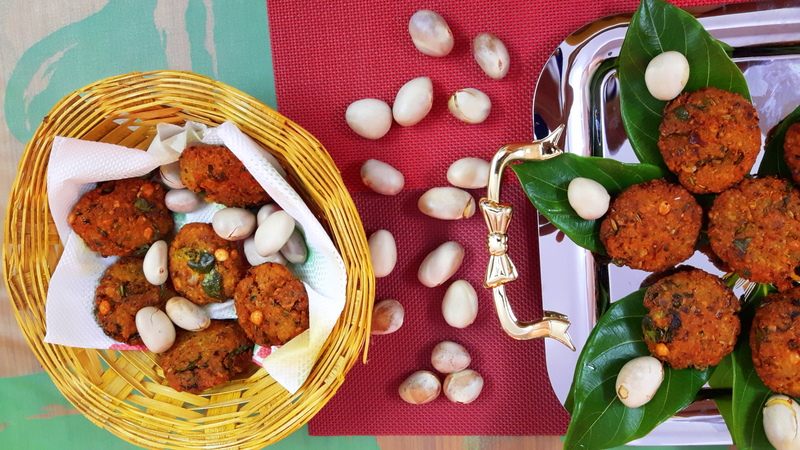 Jackfruit fritters (kathal ke beez ke pakoda) is good for evening snacks, otherwise as you wish. 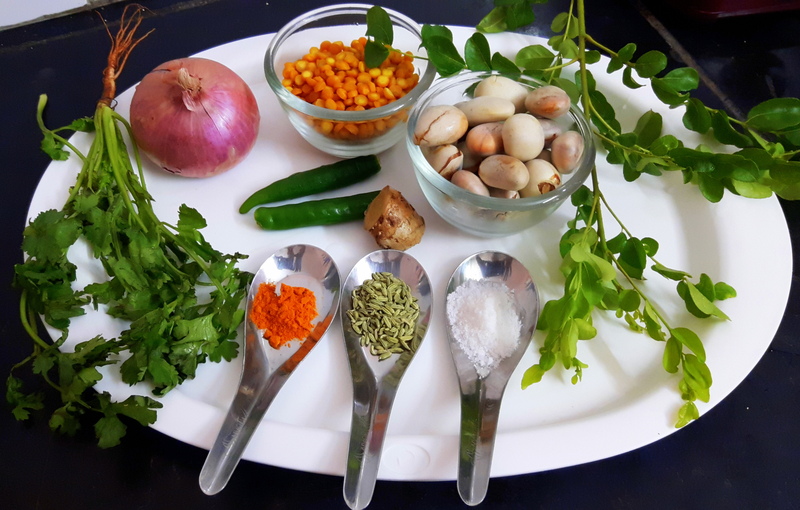 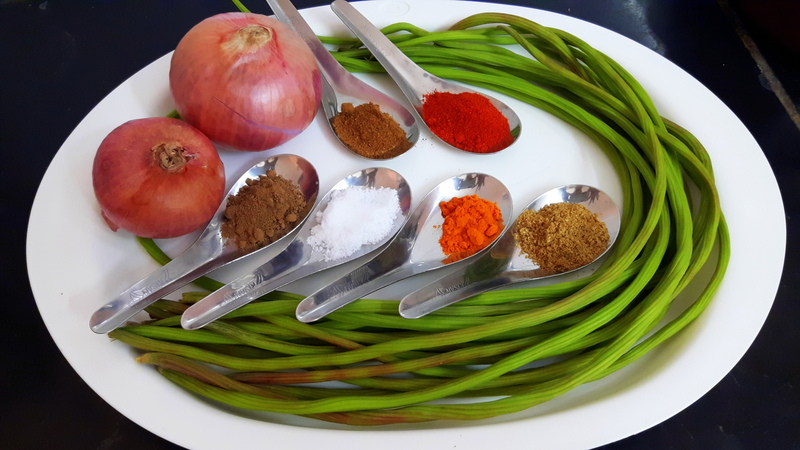 There is a saying that spicy food leads longer life; chili pepper is used to spice up food in most of Asian countries, Africa and Latin America and it entered the Indian cuisine in the 16th century with bang. 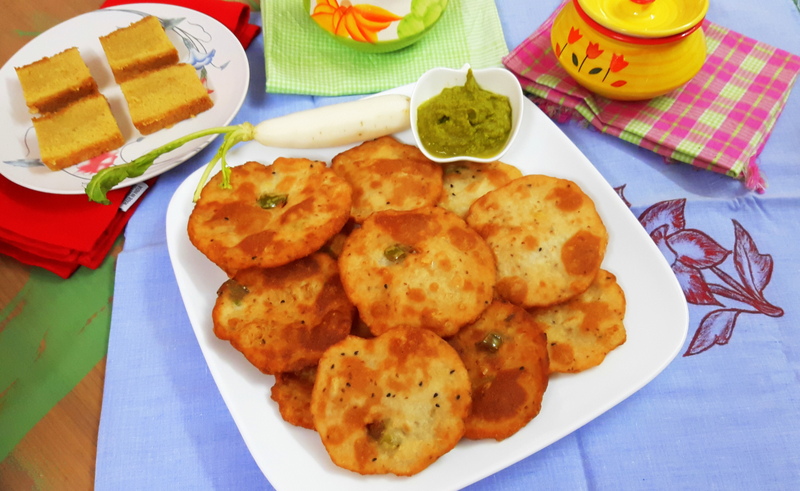 ‘Murauri (radish poori)’ is the recipe from country kitchen from Bihar in which rice flour kneaded with cooked hot chopped radish along with fresh green chili and ginger pieces. 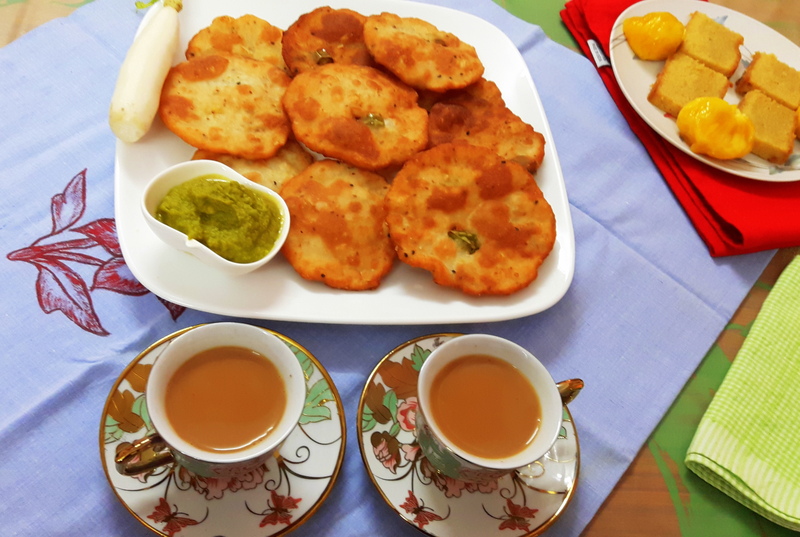 It can be served as breakfast, and can be served with tea, as per your choice. 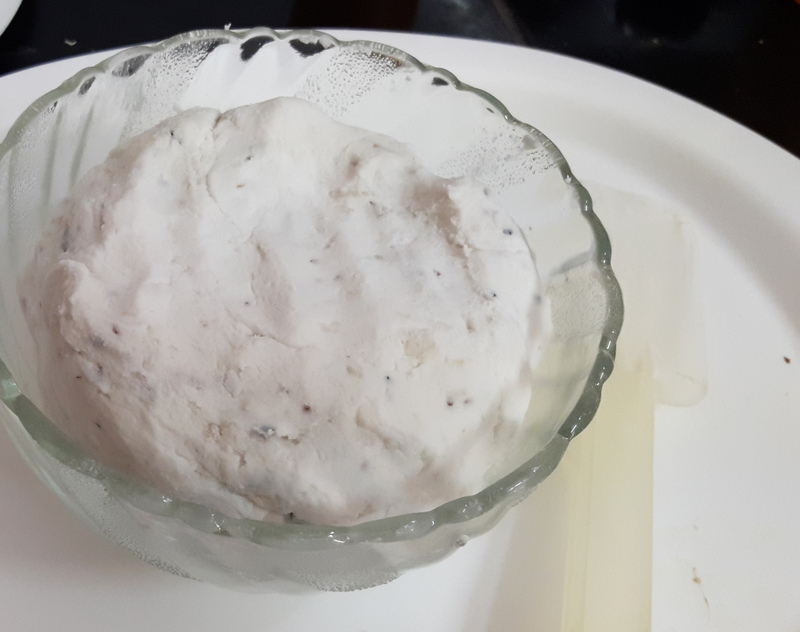 Rice flour (chawal ka Aata): 200gm. 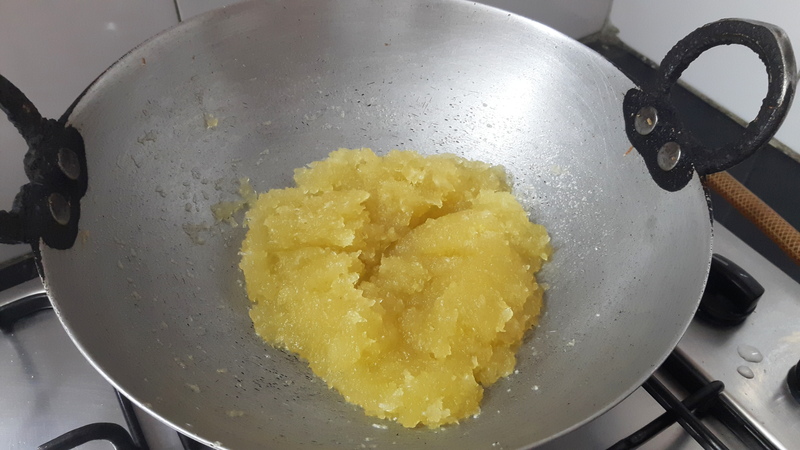 Chop radish, ginger and chili, boil/ microwave along with half cup of water, keep aside. 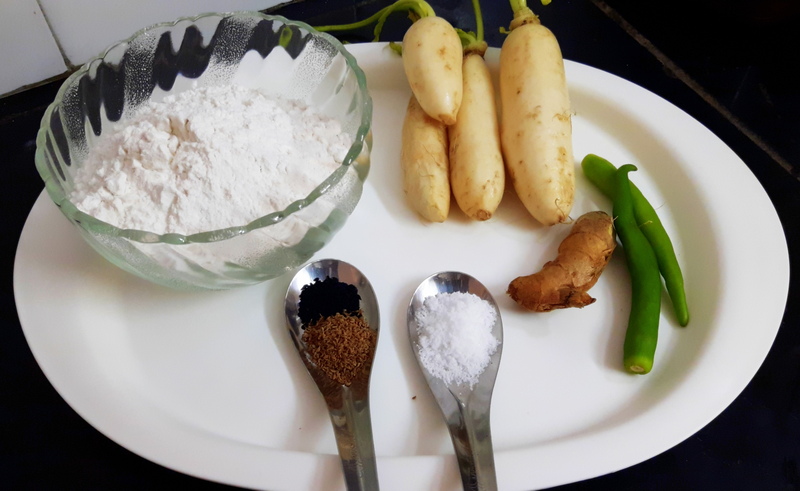 Take a wide vessel; put Aata, Ajwain, green chili, ginger and salt, add boiled radish in small quantity and knead them, if required, put small amount of water till the dough becomes soft; similar to chapatti dough. 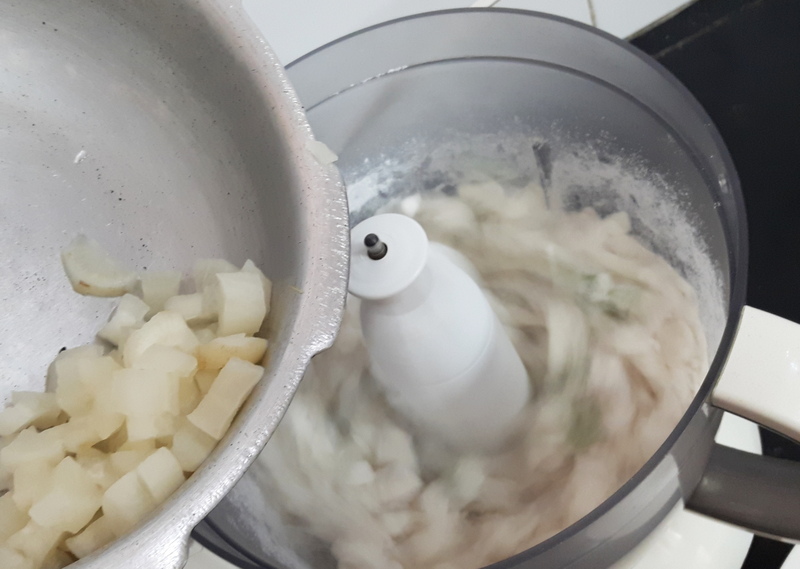 You can knead this in food processor too; it will be easy, kneading hot by hand is difficult. 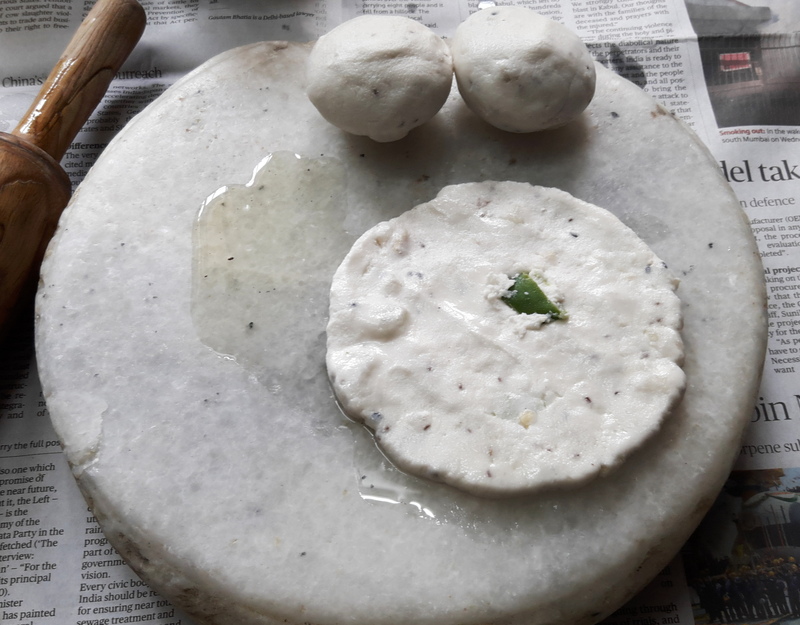 Divide dough into 12-15 parts and make the ball and roll with wet hands till 2-3 inch diameter circle as shown in the photo. 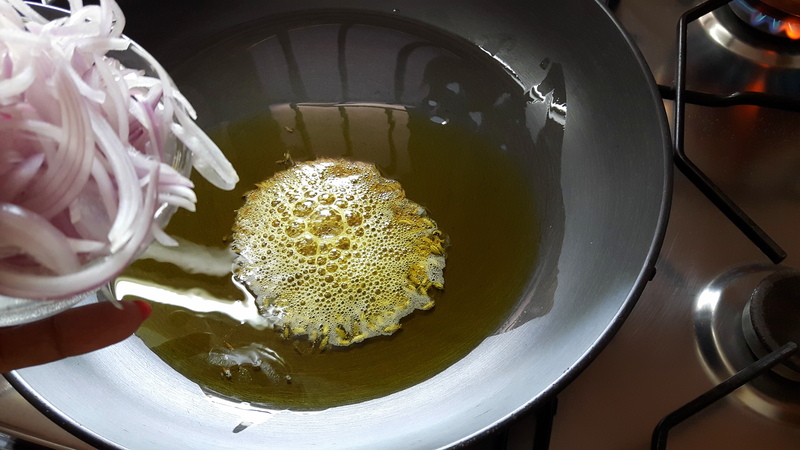 Heat oil in a pan on maximum flame (to check if oil is ready or not, put a little piece of dough in the oil; it should come up slowly; otherwise wait for a while and test again. 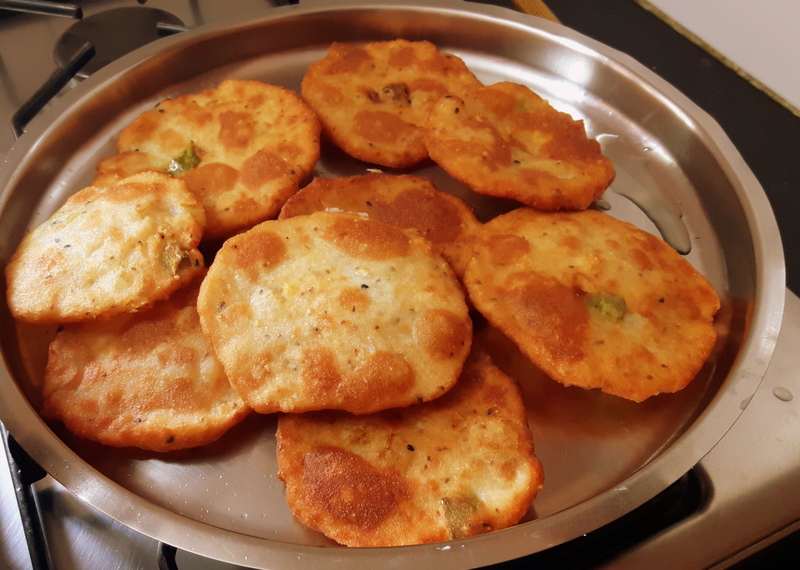 Deep fry all poori in batches on high flame, after they start to puff slowly turn over. 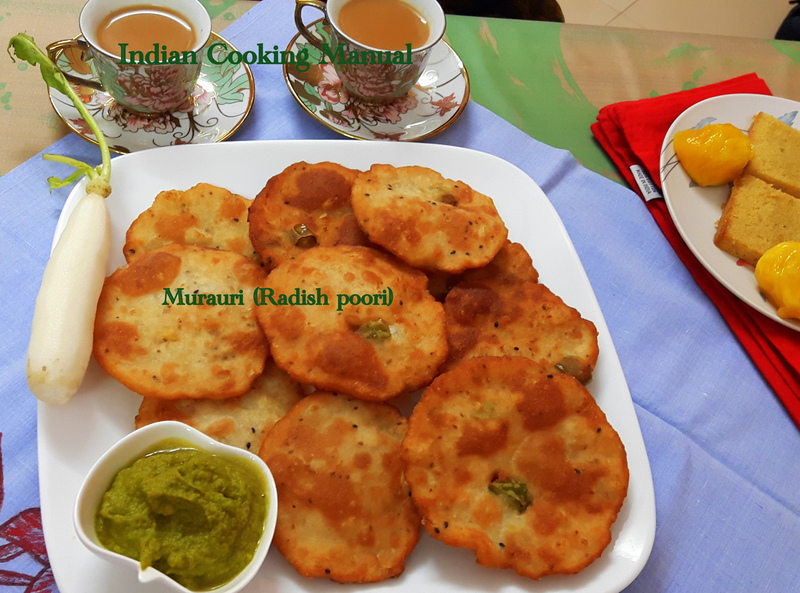 Fry till it becomes golden brown; mouth watering Murauri (radish poori) is ready to serve with afternoon tea.